Happy October! Here at Shippo, our favorite thing about the fall season isn’t the pumpkin spice lattes or the cooler temps, it’s the fact that the end-of-year holiday selling season is right around the corner. Over the next few months, we’ll be adding more advice to our Holiday Shipping and Selling Central to make sure you’re prepared to attract more customers and, ultimately, more sales. 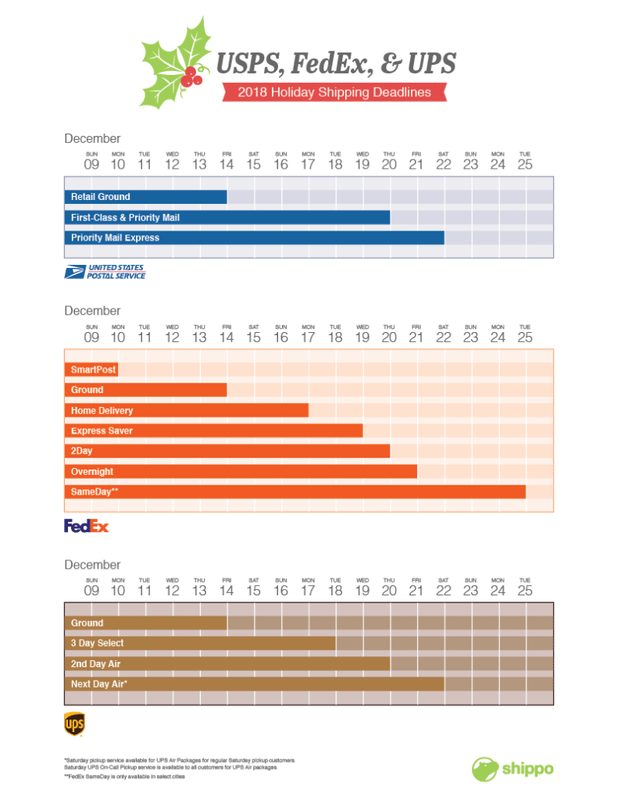 Today, we’re sharing a handy infographic that outlines the USPS, FedEx, and UPS holiday shipping deadlines to make sure your packages arrive by December 25. It’s important to shares these dates with your customers so that you can ensure your packages show up on their doorstep before the holidays get underway. Here are a couple important points to keep in mind this year. The days leading up to Christmas fall on a weekend. The carriers have limited hours over the weekend, so plan accordingly. The carriers typically extend or suspend their service guarantees around the holidays. If your package needs to arrive by a certain date, make sure you’re aware of these changes. UPS and FedEx typically tack on peak surcharges for certain packages around the holidays, as well. Visit the respective carrier websites for more information. Without further ado, here are the USPS, FedEx, and UPS holiday shipping deadlines for U.S. domestic shipments —the last day to ship to make sure your package arrives by December 25. If you’d like more carrier-specific information, you can visit the carriers’ holiday and business resources at UPS, FedEx, and USPS. For more information and selling tips, check out all of the latest updates at our Holiday Shipping and Selling Central. If you have any questions as you gear up for the end of the year, please get in touch with our support team. Wishing you a merry selling season!